Outrageously funny, Plato and a Platypus Walk into a Bar... has been a breakout bestseller ever since authors—and born vaudevillians—Thomas Cathcart and Daniel Klein did their schtick on NPR’s Weekend Edition. 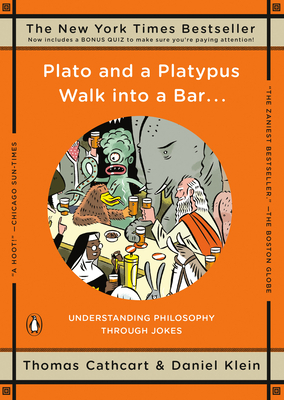 Lively, original, and powerfully informative, Plato and a Platypus Walk Into a Bar... is a not-so-reverent crash course through the great philosophical thinkers and traditions, from Existentialism (What do Hegel and Bette Midler have in common?) to Logic (Sherlock Holmes never deduced anything). Philosophy 101 for those who like to take the heavy stuff lightly, this is a joy to read—and finally, it all makes sense! And now, you can read Daniel Klein's further musings on life and philosophy in Travels with Epicurus and Every Time I Find the Meaning of Life, They Change it. Thomas Cathcart and Daniel Klein pursued the usual careers after majoring in philosophy at Harvard. Tom has worked with street gangs in Chicago, doctors at Blue Cross Blue Shield, and has dropped out of various divinity schools. Daniel has written several novels and nonfiction books as well as jokes for comedians like Flip Wilson and Lily Tomlin. Daniel Klein lives in Massachusetts, and Thomas Cathcart lives in New York City. “I laughed, I learned, I loved it.” —Roy Blount, Jr.